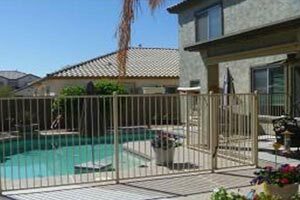 Wrought iron fences provide protection, privacy, and safety to your swimming pool area. 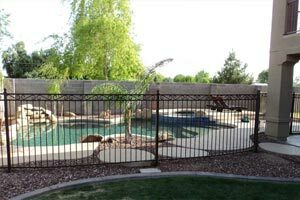 Standing the test of time, weather, and use, wrought iron pool security fences provide a safe environment for your friends and family- especially younger children, and pets. These fences not only provide a timeless, sophisticated look that so many people are after, while protecting what matters most. The color and design of wrought iron fences add to the appeal of formal properties. This fence is a classic and is sure to add to the beauty of your pool! Our fully welded construction and design of our wrought iron swimming pool security fences provide the highest level of protection. Our swimming pool fences are available in a variety of color and designs to match your current homes design and color scheme. Provide maximum safety for your children with a swimming pool security fence. Depending on the neighborhood, community and home owners association, the rules may require most you to have different regulations for your pool area. Houston Department of Health and Human Services require you to have no opening in your pool area more than 4 inches in width. This can include your wooden privacy fence, or for increase protection, a wrought iron swimming pool security fence. When researching our swimming pool security fence options, consider the additional safety functions that Art-Fences.com have available. Self-latching gates provide an extra step of security for your pool. Never worry about if you left the gate open or not, a self-latching gate will lock your pool area as you leave. Protective sealers and or powder coatings from pool chemicals and weathering. Pool chemical can be harsh on wrought iron. Sealing your pool security fence will allow protect it against weathering. Art Fences can also provide alarm systems for your pool security fence that alerts you when a gate has been opened or someone has entered the pool area.